One thing I’ve noticed since the end of #WBC15, Wine Blogger Conference held in the Finger Lakes, is a lack of controversy over any of the panel sessions and speakers. Maybe those posts are coming down the pike, but so far everyone has commented on how convivial the weekend was, and most seemed very pleased overall with the speakers and sessions that were presented. One panel in particular that I really enjoyed was Women in Wine. Wine writer Karen MacNeil; Meaghan Frank, General Manager of Dr. Frank’s Winery in The Finger Lakes; and Stevie Kim, Managing Director of Vinitaly International spoke about their success in the world of wine and the challenges they face, in a great thought provoking session moderated by Amy Power. It was very interesting to hear the generational differences from the discrimination that Karen faced back in the early days of her career, to the relatively smooth path of acceptance that Meaghan experiences. But as Stevie showed in her very illuminating presentation—women still lag behind in the top power and decision-making positions, way behind. It’s not a perfect world for women in wine by any means. I was surprised by some of the audience commentary that many women, even very young women, still feel intimidated. Lucky for me, I was blessed with good training for dealing with a patriarchal society--I went to Catholic school. Even as a child I was constantly questioning the powers that be. I could not adjust to the rigidity of the curriculum and the lack of answers to my questions. Eventually, at the age of eight, I was invited to leave Catholic school and I finally got to go to public school. I thrived in an experimental lab school with a non-graded system where pupils worked at their own level in each subject. I was only in third grade, but I studied at the sixth grade level with kids older than me. This gave me a leg up so to speak on the feeling of being an outsider, but also a sense that I belonged. When I ended up working in tech companies, where I was typically the only sr. level woman in the room, it did not faze me. Stevie Kim said she wears heels to make sure she can look more directly in to the eyes of whom she is speaking with (and I did notice she has some amazing shoes) – I’d love to do that too if was able to walk in heels with out twisting an ankle. But everyone has to find their own technique. Heels or not, Ms. Kim has obviously made the most of her considerable talents and creativity to make VinItaly and many other programs promoting Italian wine a success. The advice of the moment for women in the workplace is to “lean-in” to their careers. But I never lean in—I lean back and observe intently. I pay close attention to the conversation, especially the unspoken parts of a dialog, as more often than not it’s what’s left unsaid that becomes important. I’ve never felt held back or intimidated because of my gender. I just approach situations head-on. I know my skills, my value, my worth and I don’t let anyone else define me. I don’t think you can be equal on an unequal playing field but I believe you can change rules by your determination and presence at the table. Dealing with gender discrimination or exclusion by gatekeepers in the wine world, or anyplace is not easy. But it helps if you’ve been raised to believe your role is not merely to set the table, but to sit at the table, to own it--that it’s a given you belong, not an exception. Being strong, outspoken, honest, and female is not an easy path. Not everyone will like what you have to say. And that’s okay. Do we need legislation to make sure women are compensated equally and fairly? Hell yes. But I believe the only limits for advancing and getting key positions in any industry are in one’s own head. I’ve worked with incredibly talented and supportive men and women in my career and I’ve also run into to some very difficult people, male and female. It’s not always about gender in the workplace, it’s about the individual. W. Blake Gray’s post that the Wine Bloggers Conference is like adult camp is not a revelation; it’s an obvious observation from a first timer. Any veteran WBC attendee will tell you, wine is the topic of interest we rally around, but connecting with old friends and meeting like-minded wine lovers is the engine that drives the conference. Call it Camp with Wine if you like, but it's often the only time of year most of us see each other. It's a time to meet the person behind a blog or Twitter profile you've been following. Ironically it's also the place I get to see friends that live nearby! Like Michael Wangbickler ‏(@mwangbickler) and Liza Swift ‏(@BrixChick_Liza). You'd think living in close proximity to each other we'd see one another more frequently but that is not the case. The conversations at WBC revolve around more than wine: I spoke to Ken Hoggins (@KensWineGuide) about his daughters college plans and what type of degree would be best for her career (not journalism it was determined). I listened to Mykha’el Wilson ‏(@Mykhael) tell me about his difficult year coping with the death of his father and brother, a romantic breakup, and moving across the country. And I heard Alina’s (@onegirloneglass) tragic-comic story of the crazy family dynamics that erupted when her grandmother broke a hip. The Wine Bloggers Conference is a gathering of a diverse group of people dedicated to wine, but also devoted to each other. My goal at each conference is not to try and taste 300+ wines, but to meet and hang out with at least 3 new people. This year that mission was accomplished by meeting Regine Rousseau (@ShallWeWineChi), Joanna Snawder and Gabe Manzo of (@WineFaveSnack). Three people I know I will keep in touch with in the coming year. I thought his shut down of Stevie Kim of VinItaly for being off topic in the Wine Writer panel was extremely harsh, I don’t think Stevie was trying to hijack the conversation, and she had a very interesting question that I’ll discuss in another post. But Blake’s outburst to re-track the conversation was like seeing someone explode with Tourette’s. Yet after a delay of several hours in the Elmira airport, I saw another side to Blake—just a regular guy that wanted to get home like the rest of us. And his play-by-play call of the airline employees gathered around the wheel-well of our tarmacked plane was nothing short of hilarious. I also discovered he is a lightning fast runner as he loped out of the plane in Chicago and nabbed the last seat on the next flight to SFO (albeit the next day), while I got shunted off to Portland for the night and booked on a flight to SFO the following afternoon. It's impossible to have a meaningful conversation with everyone you meet at WBC, but if you make an effort, you can develop a friendship over three days that may very well last a lifetime. At the 2009 WBC, I sat down for my first speed tasting wondering: “What fresh hell is this?” Sitting across the table was a blogger who seemed to be thinking the same thing. That blogger was Frank Morgan (@DrinkwhatUlike). We’ve been friends ever since. If you plan to go to Lodi in 2016 here’s a bit of advice: Come for the Wine, Stay for the Camaraderie. 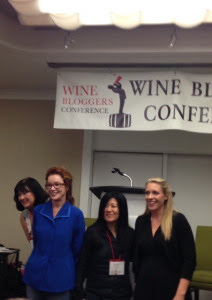 Wine Bloggers Conference Preview: It’s a Glass, Glass, Glass! In just a few days the 2015 Wine Blogger Conference will roll into the Finger Lakes region of upstate New York with the town of Corning as host. It’s a glass! glass! glass! After I heard that one of the WBC receptions would be held at the museum I looked them up. On the Corning Museum of Glass site I came across the exhibits section and the pictures of vintage pyrex caught my eye. 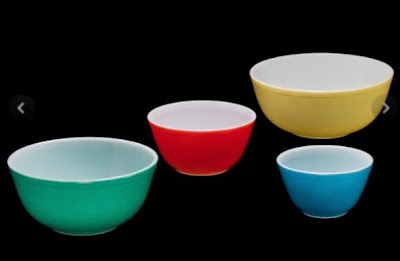 I grew up with these very bowls and square lidded containers that were the precursor to tupperware. 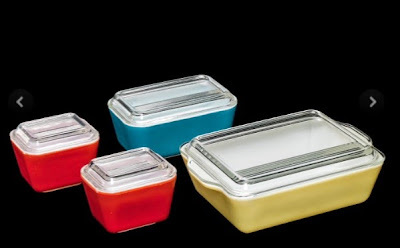 I have two green pyrex bowls (see above)and my sister had the small red casserole with the glass lid and a large yellow dish too. I had not seen the vessels for 20 years or more till my sister and I came across them in our mother’s kitchen after mom died. It was an instant memory buzz, a true blast from the past to see them in the cupboard. I can remember them in use on our dining table as if it were yesterday. When I use them, I feel like my mom and the rest of the family are right there with me. Which is great since everyone is dead now. It’s just me and the pyrex that have survived. So yes, I’m looking forward to trying the many wines of the Finger Lakes, but I’m equally excited to visit the museum and see the vintage pyrex too, no matter what Frank Morgan @DrinkwhatUlike has to say.